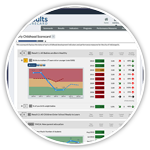 2.17 How do we create a Cost of Bad Results report and what do we do with it? Question 1: What are the expenditures we want to go down in the long run because we need less of it? Questions 2: What expenditures are embedded in these that are today devoted to reducing the cost of bad results? Create an inventory of all spending for children and families. If you have a good stage I family and children’s budget, you can use this. Categorize all spending according to question 1: spending we want to go down in the long run because we need less of it. Include whole programs wherever possible. Analyze the component expenditures of each program which fits with question 1. Look for those program components which are explicitly devoted to reducing long term cost. Add to this second category any expenditures for whole programs which are devoted to reducing long term need for remediation. Produce answers to these questions for as many years of history as possible in order to create two trend lines: one for question 1 and one for question 2. (1) The purpose of a cost of bad results analysis is to make the economic case for investments in prevention. The magnitude of the total costs associated with poor conditions of well-being, suggest that it is possible to reduce (or in the short term slow the growth) of these costs with prudent investments. 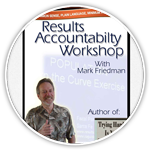 This is the business side of Results-Based Accountability. And it is useful to involve the business community in thinking about and planning this part of the work. (3) A more powerful analysis can be created by considering the TOTAL cost of bad results. There are several reasons why the total cost of bad results is the place to start. First of all, there is no problem of allocation. If you try to create the cost of a particular bad result you must take each deep end cost pool and decide how much of that cost pool to allocate to the particular results. So, for example, it is necessary to decide how much of welfare or medicaid costs are associated with unhealthy births as opposed to family self sufficiency. It is an arbitrary exercise, prone to error and more importantly open to justified criticism about any allocation method chosen. However if the total cost of bad results is developed, then the allocation problem disappears. Whole programs can be added without objection. The entire juvenile justice program from Judges to probation workers is a cost of bad results. The second reason for considering the total cost of bad results is cost shifting. It does no good to simply shift the costs of remediation from one system to another. There is a long history of one child serving system saving money by getting another child service system to bear the cost. When the cost of bad results is considered in total, then it is clear that such cost shifting does not change the total cost of bad results. This includes cost shifting into the future. It is possible to save money today on services for young children and their families at the expense of increased need for remedial services in later years. The third reason for considering the total cost of bad results is the simple financial fact that costs of prevention and the associated saving often show up in different parts of the budget. So an investment in recreation services for adolescents may produce financial benefits in the juvenile justice system. Unless these systems are considered together, then the prevention investment looks like a bad financial decision. Only when the budgets of prevention and remediation services are considered together, can the real financial case for investments in prevention be made. 1. What are the expenditures we want to go down in the long run because we need less of it?2. 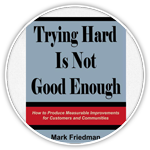 What expenditures are embedded in these that are today devoted to reducing the cost of bad results? There are several reasons why these questions must be asked in exactly this way. By labeling some expenditure as part of the cost of bad results, we are not saying that this expenditure is not needed, is not wisely spent or that the recipients of the funded services are not deserving. We are simply saying that our society would be a better place if there were fewer people who needed such services. There may be a very real need for such expenditures as foster care and juvenile justice to go up in the short run. The purpose of cost of bad results analyses are to show that our long term financial interests are best served by investments which will reduce the long term need for remedial services. By phrasing the question as stated above, both problems are solved. The second question is a way to avoid the “prevention trap.” The prevention trap occurs when a government budgeting process seeks to categorize all services as either prevention or remediation. People realize that services labels prevention will look better and may receive more funding, and so every program seeks to be labeled as a prevention program. “The prison is a prevention program because it prevents recidivism.” This is a useless and self-defeating process. By first acknowledging that some expenditures, like prisons, should go down in the future because we need less of it, there is no particular stigma attached to that program. We are simply stating the obvious. By then asking what expenditures are embedded in the first which are devoted to reducing the long term need for these services, we phrase the prevention question in a way which actually relates to the purpose of prevention. And the answers will be much more useful pointers to potential investments. Create an inventory of all spending for children and families. If you have a good stage I family and children’s budget, you can use this. If not, create a separate working inventory. Add to this second category any expenditures for whole programs which are devoted to reducing long term need for remediation. This is an even more subjective judgment and you will need some criteria which can be explained and defended in the later public process. One way of examining such expenditures could be whether the absence of this program would clearly lead to later increased remedial costs. (6) The cost of bad outcomes is closely related to cost benefit and return on investment, matters that come up in performance measurement more often that in population accountability. The principle difficulty in cost benefit or return on investment analyses is the valuation of the benefit. In business, this matter is greatly simplified by the fact that benefits of income and profit are already quantified. In social policy, it is rare to find benefits that are easy to quantify. The clearest examples occur in programs that involve cash collections, like child support enforcement or tax collection, or any government or private sector program that operates like a business (e.g. revolving loan funds, some capital budgeting, housing development etc.) . In these programs, the return on investment is more money in the bank. In other programs the calculation of benefits are much harder to come by. What are the benefits of child care, of respite care, of foster care? of elementary and secondary education? Valuing benefits requires that you first inventory all the possible ways in which benefits could materialize over a multi year period. And then for each possibility, create an analytic approach that could produce plausible estimates of effect. The much used (and maybe overused) Ypsilanti study of …. is a good example of this. The study tracked children who received quality early care and how they used public services (e.g. welfare) or created public cost (e.g. crime) and compared this utilization to a control group. The difference between the two becomes the benefit value. There are of course intangible benefits, but we will not address these here. One of the purposes of the cost of bad results is to provide a practical way to shortcut the daunting challenge of quantifying social benefit. The notion is to sum all of the cost centers where benefits could accrue and treat the total cost pool as if it were a single benefit source. If the total cost of bad results could be turned away from the baseline, then the difference (in cost savings and cost avoidance) can be counted as benefit, even if cause can not be attributed.